Yoga has always been a part of my daily life of stretching and being outside. The constant search to find inner stillness, better breathe and greater flexibility in my movement has always been a joyful meditation, but I’ve always been more drawn to sharing the experience through more playful forms of balance such as slacklining, climbing and acrobatic yoga. Instead of focusing on individual static poses and personal progression, combining the finesse and flowing movement of two people together has continued to be a more relaxed and playful practice for me. I was first introduced to acroyoga a couple years ago while living in Oregon and I was immediately intrigued by the focus and flexibility required of two people to find balance together in a very simple yet beautifully complex form of choreographed motion. The creative flows are infinite, the mood always light and the natural settings where we practice are continuously shifting. In drawing on my skills and experience with wrestling and mixed martial arts, where the goal is to counterbalance your opponent and dominate their body position, I found that transforming combative dance into its opposite focus, where cultivating a mutual balance was the goal, has brought me a new sense of mutual accomplishment. 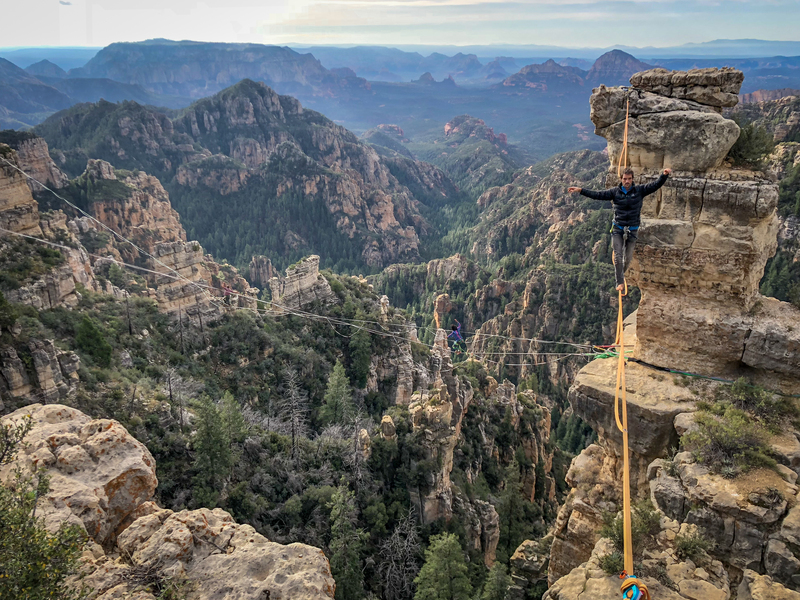 Last winter I was approached by my good friends Scott Rogers and Dallin Smith with a project idea that would join our combined skills of acroyoga, desert climbing and extensive ropes rigging in a new form of adventurous and artistic expression. To take these three disciplines and combine them into a single project, where the natural beauty of Moab’s desert towers could be displayed alongside the flowing balance of humans, became the new focus to pursue. Being the desert wanderers that we are here in Moab, Utah, Scott and I started to brainstorm some interesting environments where acroyoga could be practiced in new exposed ways. After deliberating on a number of different desert towers in the local area; which we had previously climbed, established highlines atop and BASE jumped from, we concluded that this concept of tower yoga could be achieved realistically in our own backyard. Very quickly Trimr water bottles was excited by the idea and the project was set in motion. Over a cold three day period, Scott and I climbed a couple towers, fixed ropes to their summits and began planning the logistics of getting the other yogis out to these remotely exposed locations. After two days of filming, flowing, and running around the desert to various spots, the video that you see before you was completed. I want to thank Trimr water bottles and Dallin Smith for supporting our adventurous scheming in the desert and supporting all the artistic talent for this video to come to fruition. To Chris Newman and Dakota Walbeck of CineChopper aerials for nailing all the incredible flying shots you see in the short. To Kesley Ondine and Christiana Giordano for braving the elements and putting so much trust in my ability to balance people in precarious places. Last of all I want to give a big bro hug to my best friend Scott Rogers for helping to make this dream a reality. Scott is one of the most talented all around people I’ve ever met in his ability to balance the responsibilities of filming, rigging, climbing and organizing such an awesome project. You’re all an inspiration to me and I hope with all my heart that we continue to chase our extravagant dreams and watch this concept grow with new opportunities where we can practice our balance in more exposed environments.